Your destination for stylish gift baskets. Since 2006, we’ve built the G&P-brand with a zealous attention to detail, impeccable customer service, a reputation for beautiful, hand-made bows — & the commitment to invoke a “WOW” response to each gift we create. We offer an array of gift items—many locally made—in our Raleigh-based storefront, ideal “add-in” items for baskets. Need corporate gifts? This is our specialty! We can customize gift baskets to your budgetary needs, feature corporate colors, add your promotional materials, & more — just ask! Each time you select a gift from Gingham and Posh, we trust you’ll be excited about how exceptional the basket looks and how perfectly it fits the occasion. We will make every effort to provide a product that you’ll be proud to offer to a friend, client, co-worker, or loved-one! It is our goal to supply you with a gift that will surely earn compliments on its striking appearance – but even more importantly, a gift that will absolutely delight the recipient. Gingham & Posh is committed to creating high-quality, distinctive, and stylish gift baskets to satisfy all of your gift-giving needs. Creating extraordinary gift baskets is our passion, and we hope it shows! 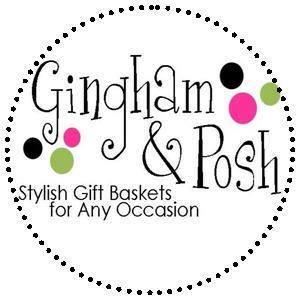 Gingham and Posh is a locally owned and operated business located in Raleigh, North Carolina in Oak Park Shopping Center. Gingham & Posh assumed the operations in March 2006 from The Basket Works after the previous owner retired. The Basket Works offered gift baskets in Raleigh since 1987. 20% off any item $20 or more on the 20th when you mention SLR $20 on the 20th.